RideSafer® - Safe Traffic System Inc.
Generally, there are two leading causes of child injury in automobile accident. One is incorrect installation and/or of a child restraint system, and the other is not using any type of child restraint system at all. According to a report from State Farm Insurance in October, 2011, 7 out of every 10 children traveled on a car seat installed incorrectly, which implies that even if they had used the most advanced and reliable car seats during their travel, 7 out of every 10 car seats could not have provided maximum protection to the occupants in car accident. Furthermore, NASS(National Automotive Sampling System) reported that among 6,300,000 children involved in car accidents from 1999 to 2008, approximately 50% of them used either adult lap and shoulder belts only or no restraint system at all. During this period, 970,000 children were injured in car accidents, and 5,046 children among them suffered fatal injuries. Identifying predictable risk factors (incorrect car seat installation, failure to be restrained, etc.) and yearning to suggest preventive solutions for crash fatalities to children, Hoon Y. Kim founded Safe Traffic System (STS) in Franklin Park, Illinois in 2000. Built on that principle and through numerous innovative structural variations in conventional child restraints, STS launched its 1st generation of RideSafer® in 2004, creating a big buzz among child safety professionals and the media. Introduced in major TV stations and news publications, RideSafer® brought an innovation to the conventional car seat market as the world’s first wearable child restraint system. Within the subsequent years of research and development after generation 1, RideSafer® not only received nation-wide recognition but also awards to attest to its advantage over its competitors. In 2005, STS received the New Technology Award and Silver Medal in Safety & Security by Invention and New Product Exposition (INPEX) further proving its innovation and high-performance. 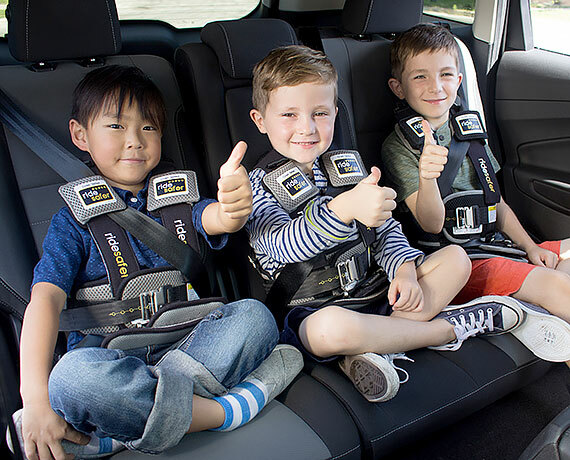 In 2017, the newest RideSafer® models were introduced, a wearable child restraint system developed and completed through years of accumulated experience, certification tests at the nation’s best test labs, and ongoing research. With guaranteed safety, convenience, comfort, and stylishness, RideSafer® travel vest promises to deliver mutual happiness to both you and your children.